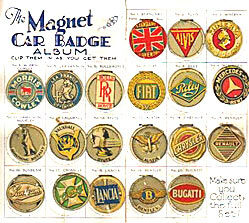 The Magnet Motor Car Badge Album of 1929. Homepage. This page: An illustrated free giveaway, presented with The Magnet comic in January 1929. This is how a complete set should look, so the hunt is on to find some for my car badge album. The Magnet comic book car badges. This interesting little album was a free giveaway with The Magnet comic, in particular the 19th January 1929 issue. 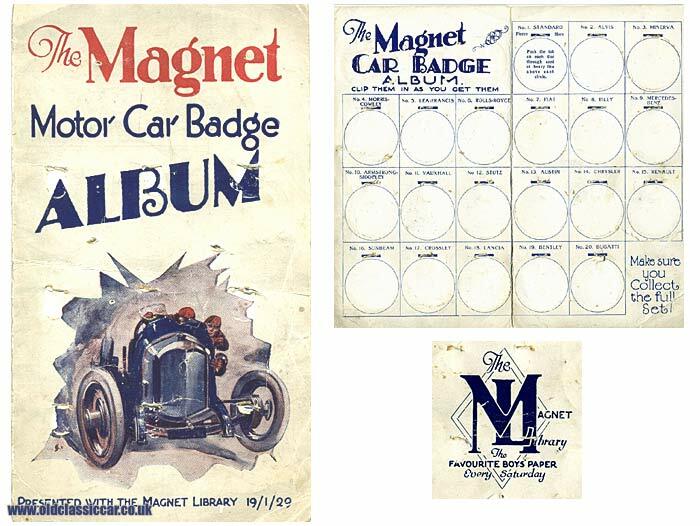 Titled "The Magnet Motor Car Badge Album", it was printed in card, with numerous slots cut into it. The idea, just as with collecting cigarette cards with a motoring theme to them, was to collect small circular badges one at a time, made from tinplate. Lithographed onto them were radiator badges taken from many of the popular cars of the day. This album sadly doesn't feature any of these intriguing car badges, so I'm on the lookout for some to go in it. One badge per week was given away, every Saturday, with the latest copy of The Magnet Library - "Make sure you collect the full set!" children were told. Shown alongside for reference is a picture of how a set of badges would have looked, so if anyone can help me find a set then please drop me a line.